Simple In The City: Big Announcement! Good morning Everyone, and Happy New Year! My tiny family and I have an exciting announcement to share with you all! This is the year that we are following our dream to go tiny! Gah! That’s fun to say. For those of you who don’t know us personally, we live in the downtown area of Hamilton, Ontario. We are the proud owners of a 1800 square foot, three story, century home that we (read: my husband) have been lovingly and painstakingly facelifting for over a year now. Part of that journey has included completely gutting our basement and prepping it for an apartment rental space. The hairbrained idea is that we ourselves are going to occupy that space, and the two other finished floors will become the ‘rental space’. 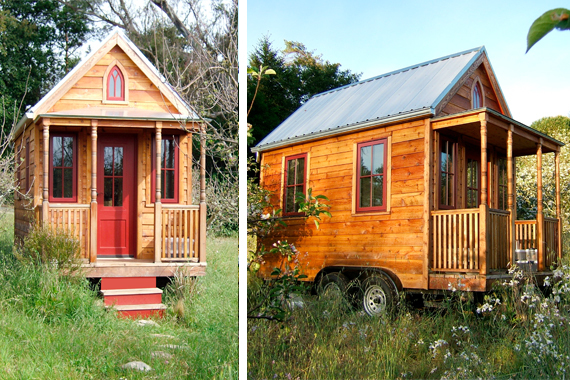 Disclaimer: we will not be living in a cute little micro cabin as pictured above. And though it will be a significant downsizing from having (quite literally) twice the amount of usable space, we measured it out and at 645 square feet it is by no means extreme in nature. Right now said space is a dirt and concrete hole, but the vision we have for it is truly lovely. We have been excitedly exploring multi-purpose spaces and efficient, comfortably small homes. My favourite part about this opportunity is that it is really challenging me to examine my relationship with our stuff even more deeply, re-evaluating once again what the essentials are. I love that having less space will mean being surrounded by our favourite things all the time! We’ve been diligently cutting down on the amount of things that we own for awhile now, but because we have a large amount of space, it’s really easy for clutter to creep back in and take root without us noticing. There also is less time and motivation for us to go through still-boxed-belongings that moved here with us from our last place because they are stacked out of sight and out of mind. Our new mindset is that if it doesn’t fit in the basement, we won’t own it. I’ll be keeping you updated as we take strides toward our tiny (and reachable!) dream. Follow us here at stepstosimple.com and also on Instagram with the hashtag #simpleinthecity. In closing, I must say that we are really interested to know what YOU think. What are your essentials? What spaces are non-negotiable for you? Hi! I’m your cousin once removed and I am really interested in this. Our first house was 4000 sq ft – 4 bathrooms and a full high and dry basement. It came with the farm my husband bought. We sold that place and were able to build our own place. While building, we lived in a 800 sq ft trailer with 3 kids! We had a great time. I planned our house – it’s 1300 sq ft. Now that our 4 kids are grown up, it’s too big again! So many great ideas out there! Have fun! I was very interested in your post and then it got me to thinking how much space I live in. Where Andy and I live is 562 square feet. When I first moved in here it seemed very small as I have always lived in a house. Some of my things are still at my parents as I don’t have the space for larger items like my book shelf of crafty stuff with a desk and a dresser with meaningful items from childhood. I am very use to living in such small quarters now and don’t notice that it only takes a second to run to the kitchen when something is burning… Haha. But I honestly have to say I can’t wait to have a house again so I can have my items with me instead of going to another location to use/pickup items I need. It’s great to hear from you Jessie! I’m so glad that you’re finding my posts helpful. Isn’t it amazing when you realize how much you DON’T need? I love having the smaller, simpler space. It has the added benefit of keeping me in check, as well haha! It is pretty amazing! I’m just having trouble purging clothes aha. I know I have WAY too many but somehow I get rid of them and it seems like nothing. Or I can’t allow myself to get rid of some of my clothes… That’s part of the problem of having a 3 bedroom house for two people, there is TONS of extra space for things to clutter.